Squash House Quilts: UFO? Just Do It! 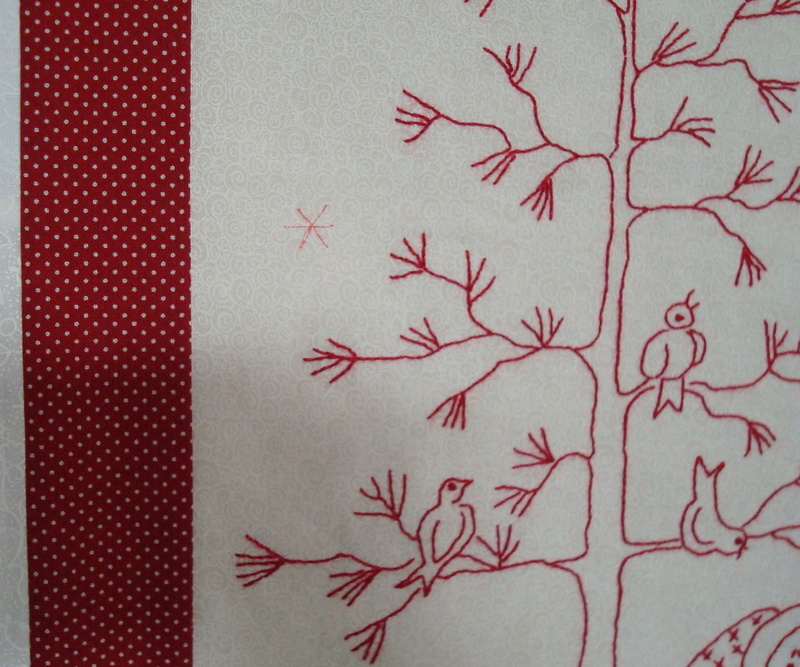 About 2 years ago I purchased the Winter Wonderland pattern from Crabapple Hill. First I worked on the stitcheries - it took nearly a a year to finish them! Then I started on the blocks, which went pretty fast. Then we finally sold our house and moved to the Squash House where Winter Wonderland sat languishing in a drawer.The past few weeks I decided it was time to finally finish this UFO! I dove in the past few weeks and voila! Now I have another flimsy for Lenni! 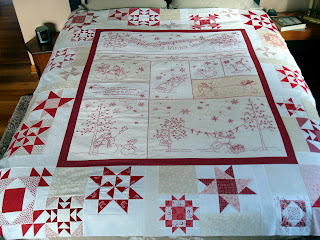 Here it is draped over the bed - I can't wait to get it quilted, bound and ready for next Christmas! The feeling from finishing this quilt top is so satisfying! So if you have a UFO sitting around that you really want to finish - just do it! You'll be amazed at how fast it goes and how good you'll feel with your accomplishment! When I finally sewed the last row and hung it on the design wall, I noticed that one tiny little snowflake had not been embroidered! Now how could that happen? I had been handling these blocks over and over while sewing everything together! I was tempted to leave it, but decided it deserved life, too! The other day Mr. Squash pointed out a new bird in the yard - at first he thought it was a quail. On closer inspection we noticed it was a Hawk! What a rare sighting. When we took an even closer look, we noticed it was consuming one of our backyard birds! We sighed at losing one of our little friends, but nature follows it's own course! Tomorrow we are heading to the big city for a few days. We tried to go just after Thanksgiving, but had to cancel due to snow! This time we've decided to be like the postman - we'll get there no matter what! Included in our adventure will be a trip to the Buggy Barn, so stay tuned for a full report! applause, applause, applause! WooHoo - it's done. And, it's beautiful, Candace. Very nice! What part of Eastern Washington do you live? A very good friend of mine lives in Ellensburg and I asked if she had heard of the Buggy Barn and she had not...I am sure she will venture the 2+ hours to go visit once she sees their shop on their blog. Love the Winter Wonderland Quilt. I wanted one so bad that I purchased one from my Churches' fall fund raiser last November. It is going to be a treat to see what you find at the Buggy Barn. Hope the the weather stays nice for your trip. It's gorgeous Candace!! You did such an amazing job on the stitching. I totally understand why it took so long. You must feel like you just accomplished so much by finally completing it! Tis the season for UFOs. I am similarly trying to work on some of mine. I can't wait to see how you quilt it!! SOON!! Buggy Barn!! You lucky girl! Take lots of photos! The quilt is beautiful! You must feel so happy to have the top finished. Well done Candace! It is a beauty and nearly a finish! Can't ask for much more than that to start off the New Year! I finished this quilt in time for Christmas this year. I too had spent so much time on it that when it was done I just felt so much better. I'm loving it as one of my best now. I have 3 more of the Crabapple quilts to work on also. I finished the Over the Hill one last year. I'm getting pretty good at these I guess. Great finish! Congratulations. One of my favorite quilts of all time! Enjoy the city. That is just lovely! It is on my To Do list as well. Your quilt is absolutely beautiful. Can't wait to see it all quilted. We will be expecting another photo next year with the finished beauty on the bed! Have a nice trip in the city. What a beautiful quilt! Happy new year, Candace. Just wonderful. I've missed stuff like that along the way. How DOES that happen? I've been working on mine for 2 yrs. and have finished all the blocks. I made mine in varigated blue floss and can't wait to get it together. Love their patterns! Winter Wonderland is just beautiful!!! I can't wait for you to get Lenni (I'm sure you're more anxious) so you can put the pedal to the metal!!! 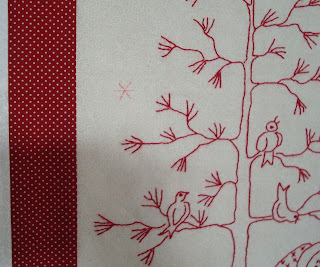 Love the snow and birds and the amazing quilt! Nicely done! Happy New Year! This turned out so nice and glad you got it finished. I bought this pattern last year and plan to start the stitchery this winter in hopes of having mine done for this coming Christmas. I am thinking about not doing the stars but putting it on a solid red background which save some time. Winter Wonderland is gorgeous! Congrats on your finish. I couldn't have left a rogue snowflake out there either. Enjoy your trip! What a beautiful quilt. Please show it again, when it is complete. I'm curious on how it will be quilted? Happy New Years - enjoy your trip. Your winter wonderland guilt is gorgeous It must feel soooo good to finish it I'm hoping this will motivate me! Bravo, on the finish, I have always loved the winter wonderland quilts. It's on my bucket list to do, but first I must finish some other ufo's that is my mission this year, take time to finish some of my own things. 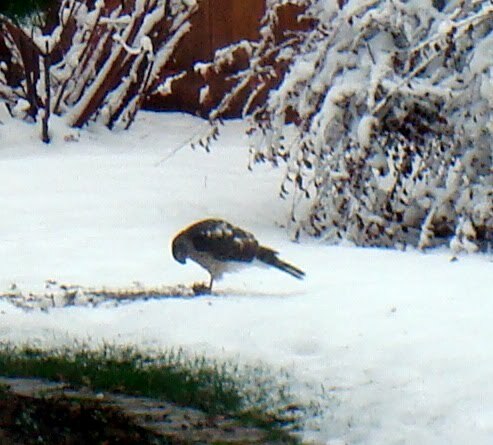 Love the picture of the hawk, I too love to watch the wildlife outside my window. YAY...great job finishing! I have all my blocks traced but I'm still trying to finish my Berry Pickin blocks. You should be very pleased, it's a gorgeous quilt and you did a fantastic job finishing it. Candace, it looks wonderful. How satisfying to stitch that last errant snowflake, LOL! Have a great trip! Stay warm and safe! I'd love to go to the Buggy Barn someday too. What an awesome finish, Candace! Hurry up, Lenni! I've been eying this pattern for some time now and seeing yours might just be the little nudge I needed to bite the bullet. Have fun on your shopping trip. Have fun and spend lots! Wow. That's a lot of redwork stitching and an absolutely beautiful finish. Wild birds are providing us with similar shows...poor bunny meets owl. That's a really beautiful quilt. Congratulations on getting it finished. Can't wait to hear all about the Buggy Barn. I've never been there, but it looks like a place I wouldn't want to leave. Congratulations for finishing this beautiful quilt - I love it! I can't wait to hear about your trip to the Big City! Congratulations on finishing your top. It will be great to have it finished in time for next Christmas. Well done. Hurray for a finished UFO! It turned out beautiful, Candace!